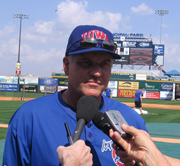 The Iowa Cubs open the Pacific Coast League season with a hall of famer as manager when the host the Nashville Sounds tonight. Ryne Sandberg begins his fourth season as a manager in the Chicago Cubs organization and says while his job is getting players ready for the majors, winning is part of that. Sandberg says once the game starts it’s about winning the ballgame, so he has just a few rules: be on time and play as hard as you can when you are out there. Sandberg says the players are becoming familiar with his style of play. He says they have a feel coming out of spring training what he will expect, and that it is for their own good, and the team comes first. Sandberg says he like to focus on fundamentals on a daily basis and that’s what he looks for from players. Sandberg’s first job as manager was in Peoria back in 2007. He says he dedicated himself the same way he did as a player and says he loves baseball and wants to ultimately manage at the major league level. 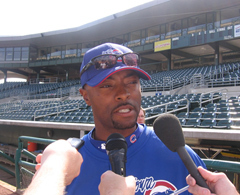 I-Cubs second baseman Bobby Scales likes having Sandberg as a manager. Scales says once you are around Sanberg you realize why he is a hall of famer. He says he looks forward to learning more as the season goes on. Scales played 51 games with Chicago in 2009 and while he did not stick with the big club he is looking forward to the season. He says there are a lot worse place to be and play triple-A baseball.